In 2004, a freak of nature stepped out of the woods near Alapaha, Georgia, less than two hundred miles south of Atlanta. Fortunately, Chris Griffin was there to shoot it. 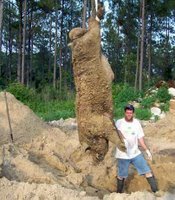 When "Hogzilla" made his national debut, in photographs posted all over the Internet, many believed the story was a hoax. “Experts” around the world claimed the image was doctored, and many implied that Griffin was a liar. Now, after two years and a little DNA testing, Chris Griffin has been vindicated. Hogzilla was exactly what Griffin claimed—a monstrous wild hog that stretched more than 8 feet long and weighed 800 pounds. (OK, Griffin exaggerated a little bit. He originally claimed the beast was 12 feet long and weighed half a ton.) Of course, for anyone sitting in safety on the fifth floor of a Manhattan apartment, this discovery is pretty exciting. But the problem, for anyone wandering the Georgia woods these days, is that Hogzilla might not be the only wild pig to be reckoned with. You see, pigs are smart—extremely smart. They’re far smarter than dogs, cats, ferrets, or any other domesticated animal. As a result, wild pigs have managed to colonize every continent other than Antarctica. And when large, domesticated pigs escape from their pens, they often mate with the wild hogs nearby. The resulting offspring are huge, frighteningly intelligent, mean, and willing fight anyone for food. Hogzilla may have been the first monster roaming the swamps and forests of North America—but you can bet he won’t be the last. Actually there quite nice if you know how to talk to them although you do have to know how to talk to them which is surprisingly hard.